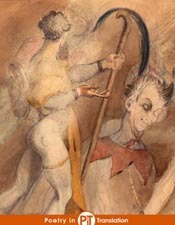 Kline, A.S., (poetry translation) "Goethe: Faust Acts I and II Complete"
A new complete verse translation of Goethe's Faust Part I and II, with stage directions, line numbers and illustrations by Eugène Delacroix (French, 1798 - 1863). Help keep this site free for all! These downloads are from a published work: ISBN-13: 978-1507547267. Like what you see? Then why not donate a dollar? Alternatively, contribute whatever you see fit.